Haus of Girls: My Sister’s Wedding: A Sneak Peek! Truly one of the best days of my life. One of the most beautiful couples on Earth. The most adorable flower girls, in cowgirl boots, ever. Father Daughter dance at it’s best. The perfect ending to the perfect day? A stacked White Castle wedding cake. Love her dress and her up-do. That white castle cake is hilarious! You have the most beautiful family!! Congratulations to your sister! It looks like a fun wedding! beautiful sisters! Love her dress and hair! 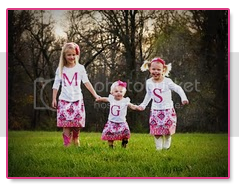 The flower girls outfits are too sweet : )! I LOVE LOVE LOVE the flower girl dresses. My wedding was that green color too. Congrats to the happy couple! !